Our fathers' God, to Thee, Author of Liberty, To Thee we sing: Long may our land be bright, With freedom's Holy Light; Protect us by Thy might, Great God, our King !!! As the first ships of the Continental Navy readied in the Delaware River during the fall of 1775, Commodore Esek Hopkins issued a set of fleet signals. His signals for the "whole fleet to engage" the enemy provided for the "Strip'd Jack and Ensign at their proper places." Thus, the First Navy Jack was a flag consisting of 13 horizontal alternating red and white stripes bearing diagonally across them a rattlesnake in a moving position with the motto "Don't Tread On Me." In 1977, the Secretary of the Navy directed that the ship in active status with the longest total period of active service should display the first Navy Jack until it was decommissioned or transferred to inactive service, at which time the flag would pass to the next ship in line with appropriate honors. USS Kitty Hawk (CV 63) became the oldest active ship on Sept. 30, 1998 when the USS Independence decommissioned in Bremerton, Washington. Machinist's Mate 2nd Class Petty Officer (Surface Warfare) Patrick Higgins of Omaha, Neb., was the Kitty Hawk Sailor who accepted the flag on behalf of his ship during Independence's decommissioning. He brought it back to Japan and Higgins presented the flag to Capt. Samar and the Kitty Hawk during the ceremony. It was officially raised on November 20th, while the ship was berthed in Yokusoka, Japan (see http://www.c7f.navy.mil/news/7frel315.html). To commemorate the attack on the USA of September 11th, the Secretary of the Navy, Gordon England, authorized all U.S. Navy ships to fly the "Don't Tread on Me" flag in lieu of the Union Jack to represent a historic reminder of the nation's and Navy's origin and will to persevere and triumph. Navy ships fleet wide commenced flying the first Navy Jack Sept. 11, 2001. There is no "end date" to this policy, which serves as a historic reminder of the United States' and U.S. Navy's origin, as well as the will of its people to persevere and triumph. (from http://www.kittyhawk.navy.mil/dtom.html; see also http://www.c7f.navy.mil/news/2002/9/23.htm). A special thanks to a reader of this page for the idea and basic information. Edict of Milan (Mediolanum), 313 A.D. -- "We have also conceded to other religions the right of open and free observance of their worship for the sake of the peace of our times, that each one may have the free opportunity to worship as each pleases". Seancaraid: It is in truth not for glory, nor riches, nor honours that we are fighting, but for freedom -- for that alone, which no honest man gives up but with life itself. The Declaration of Arbroath, per communitatem Scocie (April 6, 1320). On March 21 1775: Voters of St. John's Parish [see map] elected Lyman Hall to represent them at the Second Continental Congress. They acted because the delegates elected by Georgia's provincial congress would not attend because of the "divided loyalties" of Georgia residents. Several years later, loyalist property was being confiscated -- no more tolerance of divided loyalty. The seal from a 1778 $20 bill from Georgia shows a rattlesnake. The financial backing for those bills was loyalist land. On March 1, 1778 Georgia's Whig legislature had passed a law declaring 117 royalists as traitors and confiscating their property. The Flag of an Independent Scotland (St. Andrew's Cross) is as old as the pre-Union (St. George's Cross) of England. Flag of Colonel John Proctor's Battalion, raised in 1775. The "I.B.W.C.P" above the rattlesnake stands for Independent Battalion, Westmoreland County, Pennsylvania. The motto on the bill reads "Nemo me impune lacesset," i.e. "No one will provoke me with impunity." "A man from this place showed us two unusually large snakes he had shot. They are called rattlesnakes, because they have many rattles on their tail that make a noise like peas in a hollow and dry nutshell. These snakes are dangerous above all others but, because of the kind care of the Creator, they must give people warning with their rattling so that they won't come to close to them. There is a root here that looks like a black hellebore, which is said to be very good for snakebite if some of it is eaten and a piece put on the bite at the same time." The “official” history of the "Stars and Stripes" begins in 1777. On June 14, 1777, the new American Congress adopted a resolution, proposed by John Adams, for a unified flag, the ‘thirteen stars, white on a blue field, representing a new constellation.’ “We take,” said George Washington, “the star from Heaven, the red from our mother country [Britain], separating it by white stripes, thus showing that we have separated from her, and the white stripes shall go down to posterity representing liberty.” Congress at first did not specify how the stars would be placed, so that a few versions of the 13 star exist, including the most famous, the ‘Betsy Ross’ circle shown below on this page. Traditional thought indicates that the "Stars and Stripes" first flew over Fort Stanwix, on the site of the present city of Rome, New York, on August 3, 1777. It was first under fire three days later in the Battle of Oriskany, August 6, 1777. On November 1, 1777, the Ranger, commanded by John Paul Jones, had sailed from Portsmouth, New Hampshire, first displaying the Stars and Stripes at sea. Enroute to Nantes, the ship captured 2 brigantines, sending them into French ports as prizes -- the first time the new flag presides over combat at sea. On February 14, 1778, the French fleet gave a reply of 9 guns (Admiral La Motte Piquet) in answer to a salute of 13 guns given by John Paul Jones as he entered Quiberon Bay near Brest and Nantes, France. This is the first recognition of the Stars and Stripes given by a foreign power. As an aside, from September 30, 1787 - August 10, 1790, the flag is first carried around the world by the Columbia, sailing from Boston. When the Revolutionary War began in 1775, however, many flags were being used by diverse forces throughout the 13 Colonies, a few of which are shown above, with some English (British) predecessors, whose design elements can be seen in the post-colonial flags. "Mouse Over" each for a short description. For example the second flag, the "Queen Anne" or "red" Ensign, flew on land and at sea during Colonial times. Because the red flag flew on private (merchant) vessels, it was preferred on the land for non-military usage -- a "white" Ensign belonged to the Royal Navy and the "blue" Ensign was for a vessel in the service of the British government. Actually, this is an oversimplification of the use of the flag colors in the 18th century, usage not being standardized until a British law in 1864. The earlier (pre-1707) flag was an English, not British flag. The royal family first reserved the "Royal Union" flag for itself (this too is an oversimplification of what actually happened see http://www.flaginstitute.org/fiunionflag.htm). Public use generally occurred after the full political union between England and Scotland in 1707. The Royal Union Flag has an interesting, somewhat controversial, history in Canada http://fraser.cc/FlagsCan/Nation/Union.html. Striped flags, some red and white striped, are known to have flown on English ships as far back as the 16th century. Indeed, the Grand-Union design of 1775 (second column, third row) is virtually the same as that used by the British East India Company at the time. More specifically, the stripes in the field dated from the mid-17th century (9 stripes), the Canton changing from the St. George (English) Cross to the Flag of the British Union in the 18th century. The flag of Hawaii also shows influence of a later version of the East India standard. The history of some Revolutionary flags is not all that well-settled. It is doubtful that the American side carried any flag at Bunker Hill. If so, the flag was more probably red like the New England flag (fourth column, first row). The existence in history books of a "blue" Bunker Hill flag (third column, first row) is thought to arise from a coloring error in an illustration. Specifically, a reference book from 1710 shows a New England flag based on the "blue" Ensign, which looks exactly like that for Bunker Hill. While our Web page shows the generally accepted "Sons of Liberty" flag (fourth column, second row) with horizontal stripes, the only surviving version has 9 vertical stripes. The Bennington Flag (with the "76") supposedly saw battle in 1777, a view disputed by most today. The Moultrie flag (blue with quarter moon), while first flown in South Carolina, also is thought to have flown in Georgia; but, most Georgia flags are reported to be of the Rattlesnake design, matching its tenacious Patriots. In addition, when British-occupied Savannah was besieged by combined French and American forces, many of the standards flown were French. The Moultrie flag had several known designs, but what ever the design, it remains one of the first flags flown in a naval engagement (the bombardment of an American fort by English ships). Never-the-less, there are several other "first naval ensigns", such as the Lexington (second column, fourth row) and Culpepper flags (not shown). Alas, historians no longer recognize Betsy Ross as the designer of the thirteen star (circle) Flag, despite tradition to the contrary. Francis Hopkinson now receives that distinction. Ross may, however, be credited for having first made one, deciding that a five-sided star was easier to make than a six, but that "factoid" is not really supported by historians either. When, where and how often was her Flag flown? One famous painting shows it with George Washington, crossing the Delaware; but, that is unlikely because the event occurred about 7 months before the Flag was authorized. In his paintings Surrender of Lord Cornwallis at Yorktown and Surrender of General Burgoyne at Saratoga, the artist John Trumbull (1756-1843) appears to portray the stars as forming a square along the four edges of the blue canton (with an additional single star in the middle of the canton in the first painting). Later, Archibald Willard added confusion to the arrangement of the stars in his famous painting The Spirit of `76 (originally completed in 1875 for the Centennial Celebration, but with a better-known version painted in 1891 -- other versions circa 1880 and 1912). Finally, a ‘Betsy Ross’ type flag (but with the color of the stripes reversed) is found in the State of Georgia museum. While of much later vintage, it may be based on a Revolutionary War design that is now lost in the original. For further information, please review a concise explanation (and related pages) at: http://georgiainfo.galileo.usg.edu/usflag77.htm (from which much of this paragraph is taken). April 13, 1777 -- Battle of Bound Brook: Among the actions taking place in New Jersey during the War of American Independence, the Battle of Bound Brook represents an early, though not crushing, defeat of Washington's Troops, still on the rebound from losing New York City to far superior British numbers, even after the surprise at Trenton and later Princeton. Indeed it was these victories that made the British more determined to deliver a set back. Success in the attack came mostly from surprise, but the support of the attack by mercenary forces was crucial. Regular British columns of the day were often spearheaded by German soldiers of fortune, the shock troop Hessians. 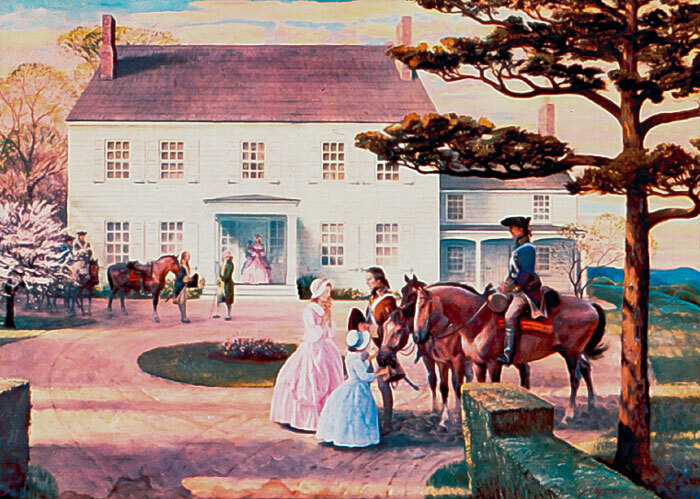 The picture shows Convivial Hall, site of the Battle of Bound Brook on April 13, 1777. This painting by John Ford Clymer was commissioned by the American Cyanamid Company. The company once used the Van Horne House for offices and restored the property in the 1940's. AM-Cy one of the oldest chemical companies in the USA (later part of American Home Products, now part of Badische Aniline & Soda Fabrik (BASF)), was one of the companies that benefited from the breaking of Dupont's explosive monopoly (technically the Powder Trust). Also known for fertilizers, dyestuffs and medicines, you probably know it best for Melmac®. More on John Clymer is HERE. General Washington allegedly unfurled the Stars and Stripes (sewn by Betsy Ross) as the national flag in 1777 on a site overlooking Bound Brook sometime after the battle near June 14th-Flag Day. Other Interesting Notes: Thirteen star flags were used on US Navy Boats (as opposed to Ships) from the mid 1860's until 1916. The Flag of the United States is the third oldest of the National standards of the world; older than the current version of the Union Jack of Britain or the Tricolor of France. A similar theme to the `Betsy Ross,' of stars in a circle on a dark-blue field, was adopted by the EC countries in 1955. Moreover, a “Stars and Stripes” with blue, as well as, red and white stripes flew over the command of one of our most famous Naval heroes (John Paul Jones), according to a famous painting depicting an event in 1779. Because an official Flag was first authorized by the Congress on June 14, 1777, this date is now observed as Flag Day throughout America (see below). The white and black Flag (above) is the banner of Britanny. While the colors (13th century Kroaz Du (Black Cross on white field)) and Capetian ermines (things that look like stars) are traditional for this celtic region of France, the design comes from 1925. It bears a striking resemblance to the US Flag. The black stripes represent the five Gaulish (French-speaking) dioceses of the region and the white stripes the traditional Breton-speaking dioceses. When first designed, it was controversial as a symbol of Breton nationalism (Breizh Atao); but today it is accepted and flown everywhere within the province. The design shown is one of several as there is no "standard" vis a vis dimensions or ermine shape. Click here for a larger version. On September 17, 1787, at exactly 4 PM, EST, the Founding Fathers adjourned the Constitutional Convention. Only one item of business occupied the agenda that day, to sign the Constitution of the United States of America. see: http://www.thisnation.com/library/madison/september-17.html. Every year this date is celebrated as Constitution Day. ...We The People of the United States, in order to form a more perfect union, establish Justice, insure domestic Tranquility, provide for the common defense, promote the general Welfare, and secure the Blessing of Liberty to ourselves and our Posterity, do ordain and establish this, Constitution for the United States of America. It should not be hoisted before sunrise nor allowed to remain up after sunset [without proper lighting]. When the national colors pass by on parade or review, the spectators should, if walking, halt, and if sitting rise and stand at attention, men uncovering their heads. On Memorial Day, May 30th, the flag should fly at half mast from sunrise until noon, and full staff from noon to sunset. As thick as hasty puddin'! Oh say! Can you see . . . .
What so proudly we hailed at the twilights last gleaming? Between their lov'd homes and the wars desolation! This “page” was awarded a Times Pick by the Los Angeles Times "way back" on 6/12/98. The boast of the red, white and blue. . . .